A great main dish for Passover. 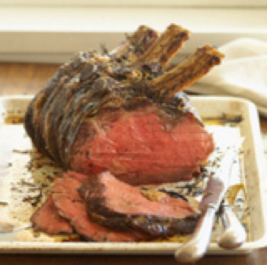 Remove the roast from the refrigerator 2 ½ to 4 hours before cooking, the longer time for the largest roast. To make a thin pan gravy, remove the excess fat from the meat drippings, leaving any meat pieces in the pan. Stir in the beef broth. Bring to a boil, scraping the bottom of the pan to loosen the meat pieces. Simmer for 1 minute and season to taste. Serve hot. This works out to be about 15 minutes per rib, or approximately 5 minutes cooking time per pound of trimmed, ready to cook roast. If you prefer medium to well done beef, add 10 minutes to the maximum cooking time for each size roast.